By Bruce Naegel, December 2015. The Department of Energy (DOE) released a study on energy trends that complements work done by Dan Kammen at UC Berkeley and Mark Z Jacobson at Stanford. 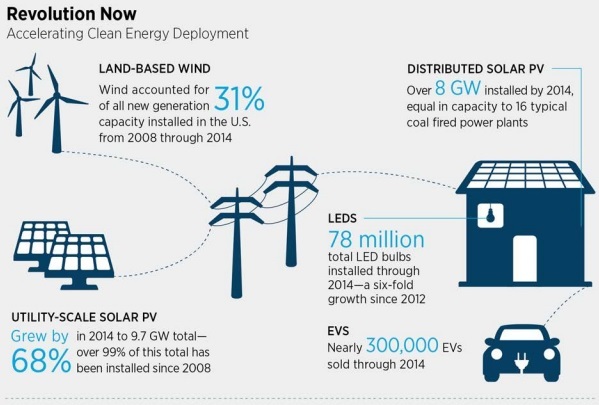 The DOE study shows renewable energy progress through 2014. The two professors have published extensively on how we can build a carbon free economy based on what we know now. The Renewables Vision in the DOE Report. Credit:Revolution Now. 1. About 70% of new generating capacity is from renewable energy, mostly wind and solar. 3. The DOE estimates that the total energy generated by wind in 2050 is 35%. The wind belt from Texas to North Dakota has enough wind to supply 20% of the energy needed by the US. 4. Land based Wind capacity is now 70 GW while the cost of Wind Energy has dropped from $.60 per Kw/Hr to around t$.06 per kW Hr. 5. Utility based Solar is continuing to drop and the lowest cost electricity today comes from a solar farm in Austin TX. With PPAs (Power Purchase Agreements at $.05 per kW/ Hr. 6. LED Lighting continues to get more affordable dropping 80% from 2008 to 2014 as part of a larger trend increasing energy efficiency. 8. Electricity consumption will grow in part as we move to an electric transportation system , We have 300,000 electric vehicles on the road in the US by 2014. In California, it is a bit under 200,000 today. The state goal is to grow s to 1.5 Million EVs by 2025. The current cost of batteries for electric cars is around $300 per kWh, and this is projected to drop to $100 per kWh by 2020. 9. The electric power industry will get increasingly cleaner over time as coal retires. However the switch to Natural Gas will have to be accompanied with aggressive monitoring of Indianapolis has aggressive monitoring and few leaks. Boston in contrast has no program and many leaks. 1. The DOE study indicates we have made progress towards a decarbonized future. This makes the goal of getting to a future where we export more renewable energy than we use more possible. 2. We need to continue down these pathways as indicated by studies from Dan Kammen and Mark Z Jacobson. 3. We need to ensure the policies are in place to keep this going in CA, and hopefully across the country. 4. Business models in the utilities sector have to evolve in a way that guarantees we continue to move to more renewable energy.